Here is the list of Best Free PDF To TIFF Converter Software For Windows. These software let you convert single PDF file to TIFF, as well as batch convert PDF to TIFF. So, you can add a single file, multiple files, or a complete folder containing PDF files to bulk convert PDF to TIFF. Some of these software are simple PDF to TIFF conversion software without any advanced options. Some are advanced converters with various PDF to TIFF conversion parameters to set. These let you set output image DPI, select PDF page range for conversion, set TIFF compression type, set image depth, and more. The software listed here are dedicated PDF to TIFF converted software, PDF to image converters, PDF utility, and you will also find a command line PDF to TIFF converter. Go through this list of best free PDF to TIFF converter software to read a brief intro about the listed freeware. It will help you out with making a selection based on your needs. I like Free PDF to All Converter the most as a PDF converter tool. It has almost all the features required for custom PDF to TIFF conversion. You can also carryout batch PDF to TIFF conversion using this freeware. I also like Ghostscript as it lets me convert PDF to TIFF in command line. Free PDF to All Converter is a free PDF to TIFF converter, which can convert PDF files to TIFF and various other file formats. It lets you convert PDF to multipage TIFF and you can set various conversion parameters as well. You are allowed to set DPI, Color depth, and Compression type for converted TIFF files. Another feature that I would like to highlight is that this is a bulk PDF to TIFF converter. So, you can add multiple PDFs to the conversion list. Select a directory to save converted files and begin the conversion. Talking about other PDF conversion formats, you can convert a PDF into DOC, HTML, XLS, PNG, JPEG, etc. JosePdfTool is a fantastic PDF utility with PDF to TIFF converter and many other PDF tools. After opening this software, you will view a list of PDF tools. 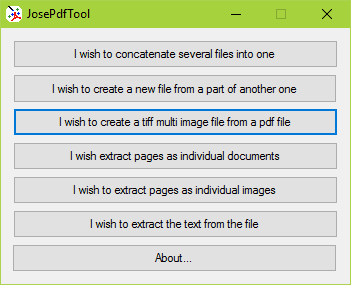 Select the “Create a TIFF multi image file from a PDF file” option. This opens a new converter window. Here, you can select only a single PDF file for conversion at a time. There are two conversion options that let you set output TIFF type and Resolution of TIFF. You can select from the following TIFF formats: di24nc, tif12nc, tif32nc, tifale, tiffg3, tiffg32d, tifg4, tiffgray, tifflzw, and tiff. If you do not need bulk PDF to TIFF conversion, this is the tool I would recommend for PDF to TIFF conversion. You can easily convert PDF to TIFF using Ghostscript. Ghostscript is a powerful PDF tool, which can be used as a command line PDF to TIFF converter. All you need to do is enter the relevant command in CMD after installing Ghostscript, and it will convert your PDF document into TIFF image file in no time. Open Command Prompt after installing Ghostscript on your computer. In Command Prompt, navigate to the folder containing the ghostscript exe file. Run the command and the result will be saved as a multipage TIFF in the specified location. For more help regarding this PDF to TIFF conversion process using Ghostscript, visit here. Free PDF to TIFF Converter is a free software from Free PDF Solutions. It lets you convert PDF to TIFF with various customizable options. You can also batch convert PDF to TIFF using this freeware. Its easy to operate and lets you convert your PDF files without any complexity. Begin PDF to TIFF conversion by selecting a PDF or selecting a folder containing multiple PDF files. Now you have to choose the output format as TIFF. There are two tiff output options: tifflzw and tiff24nc. tifflzw renders black and white TIFF, while tiff24nc renders colored TIFF. In the Preference menu, you can select the PDF page range to convert, set output TIFF quality, and limit 1 image per page on output TIFF. Fox PDF Reader is a free PDF reader software that can be used to convert PDF to TIF or TIFF. The conversion process is really easy, but there is a drawback to it. You can only use it to convert one PDF page at a time. When you open and view a PDF page, then click on the button circled in red in the above picture, a new window opens. This window lets you convert the current page of PDF you are viewing into TIFF. You can also convert that PDF page to JPEG or PNG images. The inability to convert multiple PDF pages at a time, limits the function of this software as a PDF to TIFF converter. Viscom PDF to TIFF is another simple yet amazing software to convert PDF to TIFF for free. You can only convert one PDF at a time. There no conversion options at all, and you can only convert PDF to TIFF. All you have to do is add a PDF file and click the convert button for TIFF conversion. An additional feature lets you view the PDF file that you have loaded for conversion. PDF To Images is a free software to convert PDF to image files, and you can use it to convert PDF to TIFF. You will not find any advanced option here for PDF conversion, except an option to set DPI of output TIFF file. You just need to add a PDF file, select output format as TIFF, set DPI, and begin conversion. In addition, you can also view the loaded PDF file on its interface. Other image formats for PDF conversion are JPG, PNG, BMP, etc. LibreOffice is an open source and free office suite. You can easily convert PDF to TIFF in LibreOffice. When you load a PDF file here, it opens in LibreOffice Draw. Here, you can view and edit a PDF file if you want. For PDF to TIFF conversion in LibreOffice, go to the file menu and click the Export option. This option opens a popup which asks you to select the image format for conversion; select TIFF. You will not find any advanced option and conversion will be carried out easily. The drawback of using LibreOffice as PDF to TIFF converter is that, it only converts one page of PDF at a time. The current page being viewed in LibreOffice Draw will be converted. Select and open other pages to convert them, one at a time. Converting PDF to TIFF in OpenOffice is similar to LibreOffice. But, OpenOffice cannot open PDF files by default. If you use OpenOffice, you can download and install a PDF importer for it from here. After adding this importer, import a PDF file in OpenOffice, then export it as TIFF. As I said, the process is similar to LibreOffice, all you need to do is select TIFF as the format to export PDF. You can only export a single PDF page at a time. No advanced PDF to TIFF conversion options are available here. PanteraPDF is a free PDF utility that can carry out various PDF based operations; one of them being PDF to TIFF conversion. To convert a PDF to TIFF, you will have to first of all load the PDF file you want converted. In the Export tab, you will find Page Images export option, the one encircled in red in the above image. Clicking it will open a popup. In this popup, you will have to select file format as TIFF, image resolution (DPI), and page range to convert. You can also tell this software to convert just the selected pages of PDF. There are various TIFF image types that you can select for conversion. These are: BW_TIFF_G4, BW_TIFF_LZW, GRAY_TIFF_NC, COLOR_TIFF_RGB, COLOR_TIFF_CMYK, and COLOR_TIFF_CMYK_SEP. pdf2tiff seems to be a very handy and efficient PDF to TIFF converter software, which also lets you batch convert PDF to TIFF. The PDF selection and conversion process is pretty easy, but there’s a major drawback of this software. The output TIFF files are black and white. So, if you are looking for a PDF to TIFF converter which processes black and white TIFF output, then this tool may be your pick. The integrated file browser makes it very easy to select input and output folder. A single click on convert option, converts PDF to TIFF without the need of setting up output parameters. Free version of ChiefPDF PDF to Tiff Converter lets you convert PDF to TIFF without any advanced options. Its a batch PDF to TIFF converter, thus lets you add multiple PDFs for conversion. You can go to the Preference menu to view advanced conversion options, but none of them work for the free version. You can only select the output folder to save the converted files. Simply begin conversion after adding PDF files to get converted TIFF files. The software asks you to register to be able to use the advanced settings. Advanced settings let you set output DPI, Image color depth, TIFF compression, and output quality. The free version of Pdf To Tiff Converter 3000 lets you convert PDF to TIFF easily. The free version has certain limited features, but does its job of converting a PDF file to TIFF. Its a batch PDF to TIFF converter so you can add multiple PDFs for conversion. Simply add a PDF or load a folder containing multiple PDFs. Before conversion, there are certain conversion parameters that you can set. Like, you can choose the output TIFF type to contain all the PDF pages to a single TIFF , set output image size, and also set Watermark. Carry out the conversion after setting all the output parameters. You can even select a custom folder to save the converted files. Do note that a small watermark with the website URL of this software is added on each page of TIFF, which can be ignored if you are not using it for commercial purpose. DocuFreezer is a free software to convert PDF to TIFF only for non-commercial purposes. It can convert a single or multiple PDF files to TIFF at a time. Select the output format as TIFF. You also get options to convert PDF to JPEG or PNG. TIFF output option lets you select from single page TIFF output or multiple page TIFF output. Do note that the output TIFF contains small watermark with DocuFreezer’s logo and Website URL on each page of TIFF. The watermark can be ignored if you are using it for personal purposes. I would recommend this very good PDF to TIFF converter software if you are going to use it for non-commercial purpose, and presence of watermark doesn’t matter to you. Use Icecream PDF Converter to convert PDF files with upto 10 pages to TIFF for free. You can batch convert PDF to TIFF here with no limitation on number of files. The features that I like most about Icecream PDF converter is, you can select page range of PDF to convert and it supports conversion of password protected PDF files. You can also choose if you want split TIFF or not. Conversion parameters can be changed for each PDF file separately. In addition, this software lets you convert PDF to various other formats, such as: doc, docx, rtf, jpg, png, bmp, etc. You will also find option to convert different files to PDF format. Office Convert PDF to JPG JPEG TIFF is another free PDF to TIFF converter software with limited features. You can also carry out bulk PDF to TIFF conversion using this freeware. Working princliple of this software is simple. Simply add a PDF or folders containing PDFs to convert, set output folder, and select the output file type as TIFF. You can also set output file naming parameters. The limitation of this software is that it converts each page of PDF as a single TIFF. There are some more features that are not available in the free version. For example, paid version of this software lets you add your own watermark to the converted file. I would select it if I wanted to convert all the pages of a PDF into single PDFs. ByteScout PDF MULTITOOL is another PDF utility only free for non commercial purposes. It can carry out various PDF related operations, but let us just concentrate on PDF to TIFF conversion. After loading a PDF, you will have to select image conversion option. On the popup that appears, select if you want to convert all pages of PDF or just the page you are viewing. Select output image format as TIFF, select image DPI, and choose the type of TIFF compression. TIFF compression types are: LZW, CCITT3, CCITT4, JPEG, and RLE. You can also select if you want just want to render text, image, vector objects, or all. I would like to bring it to your notice that it converts all the pages of a loaded PDF as separate TIFF images.